PHILADELPHIA – After graduating from college in 2002, Johanna Lopez spent a decade working in the banking industry before enrolling at the local community college in El Paso, Texas. “I started off as a receptionist and then became a teller, but I couldn’t advance any more because I did not have a degree,” said Lopez, who planned to study business but after taking a Chicano literature course decided to double-major in history and Chicano studies. .
After transferring to the University of Texas, El Paso, Lopez set her sights on earning a Ph.D and becoming a university professor. Now, she’s one step closer to achieving that goal, thanks to a $5.1 million grant from the Andrew W. Mellon Foundation that was created to increase the number of Latino professors working in the humanities at colleges and universities across the nation. “I feel like I’m ready for graduate school,” said Lopez, 33, a fellow in the HSI Pathways to the Professoriate, an innovative five-year program between the Penn Center for Minority Serving Institutions at the University of Pennsylvania and three Hispanic Serving Institutions: Florida International University, The University of Texas, El Paso and California State University, Northridge. Five majority research institutions – New York University, University of California, Berkeley, University of Pennsylvania, Northwestern University and University of California, Davis – are partnering institutions. HSI undergraduate students participate in intensive summer research programs and cross-institutional conferences while receiving mentoring and support for applying to and enrolling in graduate school. Lopez, the first in her family to attend college, has reaped the benefits of participating in the program. She has been accepted into the Ph.D. program in history at the University of Iowa and is waiting to hear back from several other institutions before she makes a final decision next month. She said participating in the HSI Pathways to the Professoriate program has given her the confidence needed to pursue her academic interests. Over this past weekend, the fellows gathered in Philadelphia to present their research and engage in discussions on a variety of topics that focus on identity, mental health and writing and publishing in academe. Another fellow, Amanda Gonzalez Izquierdo, has been accepted into a doctoral program in English at Rutgers University. A Cuban immigrant, Izquierdo said she is interested in studying the literature of the oppressed and the intersection between power, oppression and language. Her goal is to understand postcolonial societies and the language of the colonizer. Like Lopez, Izquierdo is the first in her family to attend college. Having a mentor to help her understand the graduate school application process has been especially useful. The HSI Pathways to the Professoriate program, which eventually will support 90 students, is designed to build communal support among the participants, said Paola “Lola” Esmieu, the associate director for programs at the Penn Center for Minority Serving Institutions. 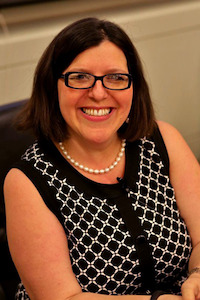 Dr. Marybeth Gasman, the Judy & Howard Berkowitz Professor of Education in the Graduate School of Education at the University of Pennsylvania and the founding director of the Penn Center for Minority Serving Institutions, said current fellows will be tracked through the first year of their doctoral program and a new cohort has already been selected. The program support is encouraging for Yaquelin Morales, a student at California State University, Northridge who has an interest in examining gentrification and its impact on low-income communities. She has already been accepted into a Ph.D. program at the University of California, Merced and is waiting to hear from other institutions. No matter where Jasmin Flores eventually lands for graduate school, she said, she plans to someday return to the University of Texas at El Paso to teach English as a faculty member. Jamal Eric Watson can be reached at jwatson1@diverseeducation.com. You can follow him on Twitter @jamalericwatson.